Meet my Christmas nerd project this year. In late October my partner was re-watching some Boston Legal episodes, when the following scene caught my eye. As you can see, one of the lead characters, Alan Shore, is attepting to spread some Christmas spirit in the office by wearing a star decoration and we see at the end of the scene that the star has dancing lights that can be activated on demand. This got my mind wondering if I could do something similar for the office, perhaps something I could attach to my monitor instead of being a wearable prop, and perhaps responding to project build status in Jenkins or alerting metrics. Due to my partner travelling a lot in November, I had lots of opportunity for research. 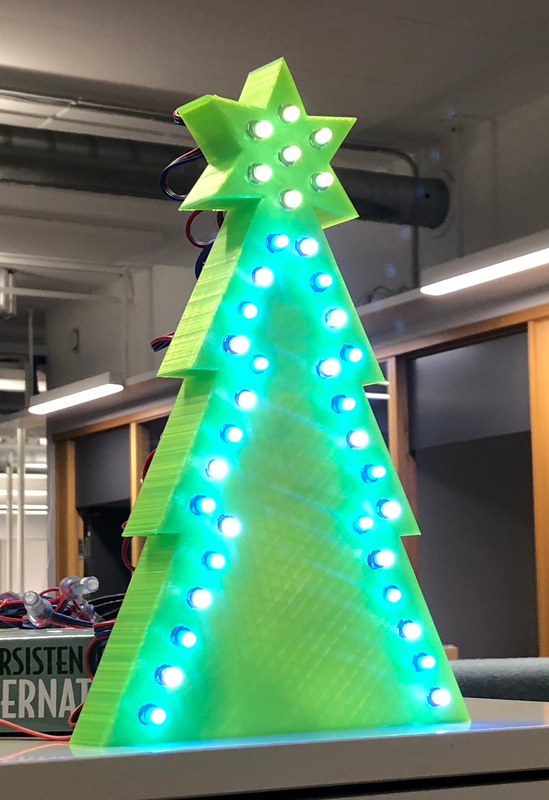 From starting with a google search or two my journey started with reading about Neopixels, moved quickly to the WS28XX standards and somehow stumbled into xLights, Falcon Player, Ray Wu, Boscoyo Studio and the world of Christmas Lighting. After an evening or two of reading, watching and convincing myself I decided to place a few orders to get something small running at home (might write about this later), and the following evening I threw caution to the wind and added an order for 50 9mm bullet pixels from Ray to also do something for the office. And so began a period of waiting for the deliveries, my next post in this series will detail all materials and how I connected everything up.